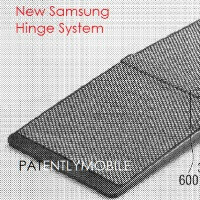 Yesterday, we reported that Samsung may be planning to launch an unique, foldable smartphone in 2016. Such a device is definitely being worked on, judging by the leaked patent schematics that describe different ways in which Samsung experimented pulling off this type of novelty. Speaking of which, today Patently Mobile uncovered a purported schematic for a foldable smartphone that opens and closes together with a hinge mechanism. This is no flip-phone, however, as there is a mesh-type textile sheet attached as the cover of an actual bending AMOLED display. The device is separated in two "bodies", connected via hinge portion. The hinge operates with a spring mechanism that looks incredibly old-school for a device that's supposed to be this hi-tech. Samsung filed this patent application in the third quarter of 2014, which means this isn't a particularly recent development and could have advanced into a state where mass-manufacturing could be in consideration. That is, assuming Samsung actually kept working on it, rather than killing it to concentrate on the gazillion other projects it's running in-house. Still, the schematic does look very similar to the concept device Samsung had previously shown. It can be seen in the second slide. Reportedly, a foldable Samsung smartphone, whatever its shape and form might be, is being tested with a configuration that includes a Snapdragon 620 or 820 SoC, 3GB of RAM, and a microSD card slot. It's supposed to be released sometime next year, given that Samsung expects to have production-ready foldable smartphones by 2016. I like old school stuff! Dont worry its a gimmick. Don't embarrass yourself by writing these sort of comments. How could you not notice lel xD! Not fluent in internet talk... is /s short for sarcasm? Because I don't find this gimmicky at all actually. Sounds interesting, though too much flex would make it troublesome to use? And I have to wonder about wear and tear from continual flexing? Lol, I got a padfone infinity for that. But this folding thing might work a little more effectively space wise. This is a real innovation by Samsung. I wonder how Apple gonna catch up. Apple might need 5-8 years to mimick this samsung galaxy X.
Apple just do the patent, but don't have/develop actual product. It's an apple way to prevent a real innovation being developed, by suing the real innovator. and if apple did it (10 years latter), apple will use samsung display. not apple. apple is the copycat who sue the real innovator & creator. So.......a flip phone basically.. this whole bendable, flexible displays thing this isn't going to be the next big thing, why? because it adds no functionality to the devices itself. But...you do realize that development and production of experimental devices like this will pave the way for these new technologies to become more commonly implemented in the coming years, right? Things like this can become standard in just a few years, but only if it is worked on and if someone does it first to test it out. And, regarding its functionality, the idea is to have a large screen available at all times because the folded device will be half the size and take up half the space. It means we could have phablet sized screens on our phones but put a compact sized device in our pocket, or maybe have a tablet sized screen on a phablet sized device that could still be pocketable. That's what they said about phablets. Now Samsung phones will be able to bend too.